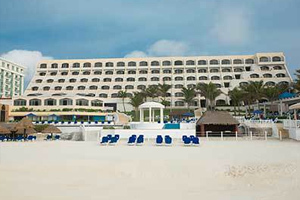 The gastronomy is one of the hallmarks of our Adults Only resort in Cancun. 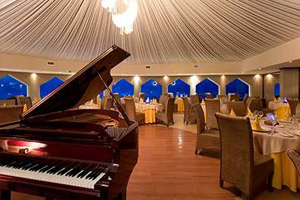 There are different gourmet venues available for you to enjoy a holiday full of taste and typical scents from the Caribbean. Savor dishes with touches of the international cuisine elaborated with first-quality products by the best team of chefs in Mexico. Local specialties, exquisite cocktails and stunning panoramic views. Besides, all our guests will enjoy free access to all the restaurants of our neighbouring resort, the Golden Parnassus All Inclusive Resort & Spa, with free transfer every hour, with no reservation needed and no minimum stay required. It is a buffet restaurant by the sea. The Paradise restaurant is the exclusive Italian, Japanese and Mexican cuisine restaurant of our Adults Only resort in Cancun. It is a buffet restaurant by the sea, offering an exceptional gastronomic service with specialties from the three countries and touches of innovation and tradition. Savor the tastes that will take you to another place and experience thousands of unique sensations. Breakfast: 7:00 a.m. - 11:30 a.m. Lunch: 12:0 p.m. - 4:30 p.m.
An authentic Japanese restaurant at the heart of the Caribbean? An authentic Japanese restaurant at the heart of the Caribbean? Yes, and with the best Japanese specialties elaborated with first quality fresh products and the special touch of our chefs. At the Sumo Restaurant, with a lush and exotic decoration, you will be able to take in the charm of Japan on your table, with delicacies including the Teriyaki meat with vegetables or udon noodles with shrimps. You will be able to savor the best international specialties. The Shangri-la restaurant in Cancun is our most exclusive venue for dinners. A gourmet area where formal attire is required in order to keep the select ambiance of its dining room, where every detail matters. 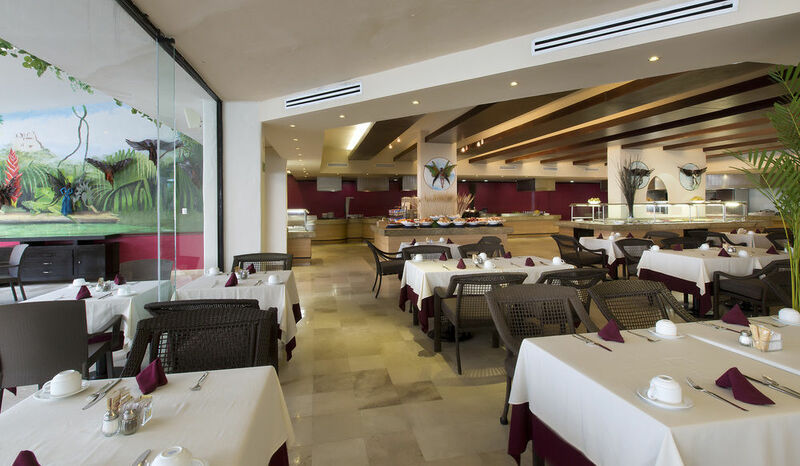 You will be able to savor the best international specialties with an innovative and modern touch. A restaurant of marinière cuisine with seafood and pasta specialties. 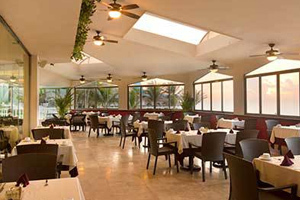 Our Pier 12 restaurant in Cancun reflects all the charm of the Caribbean Sea. It is a restaurant of marinière cuisine with seafood and pasta specialties. 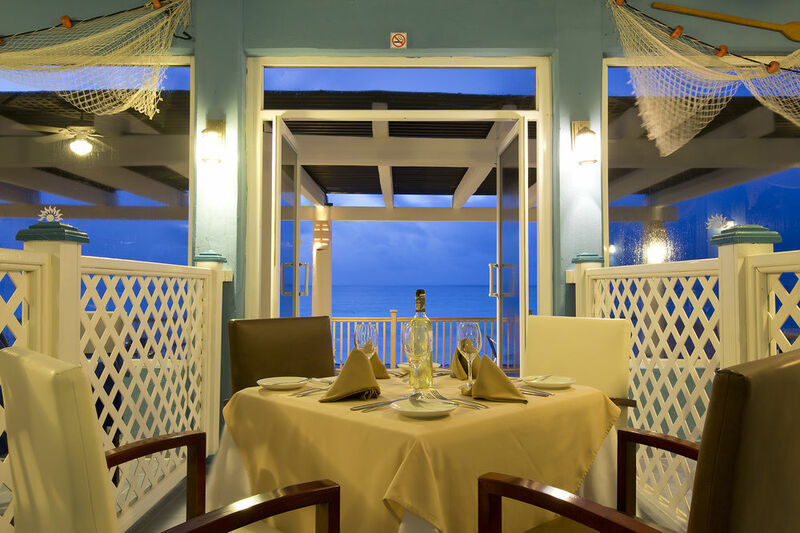 We invite you to try some of the most exquisite specialties, such as the hogfish fillet en papillot or the Indiana fettuccini with chicken, tomato sauce and parmesan. You will surely repeat. Lunch: 1:00 p.m. – 5:00 p.m. Dinner: 5:00 p.m. - 09:00 p.m. 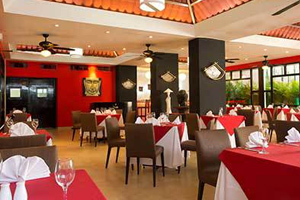 Restaurant full of elegance, select ambiance and delicious fresh dishes. Take pleasure in a restaurant full of elegance, select ambiance and delicious fresh dishes with a sophisticated touch. 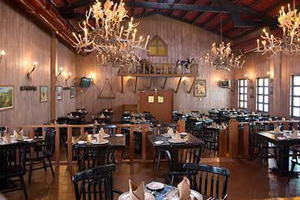 We are talking about the OldBarn restaurant, located in the lobby of our Adults Only resort in Cancun. 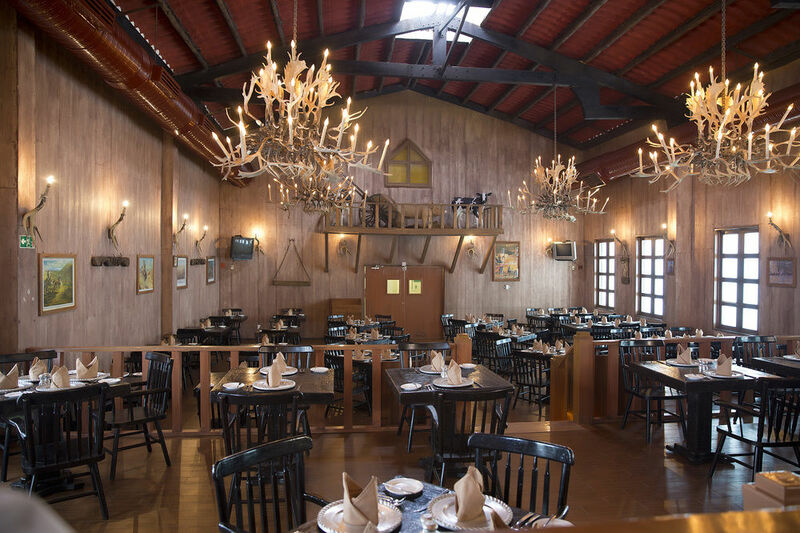 Here you will be able to savor healthy salads, a delicate fillet mignon, the famous New York rib or steak with typical Mexican dishes, such as the pork medallions with tequila sauce. 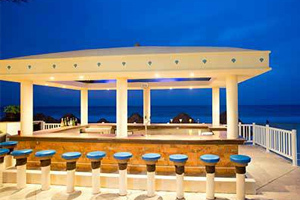 The most delicious nook of our Adults Only resort in Cancun. 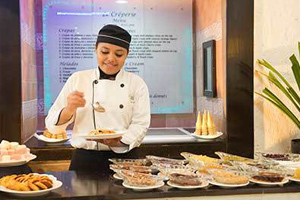 Come to our Creperie and pamper yourself by the Caribbean Sea with a varied menu of coffees and cappuccinos, pastries and fresh breads, ice cream cakes, handmade pies, surprising sweet crepes and a wide assortment of ice-creams. The most delicious nook of our Adults Only resort in Cancun. Enjoy a personalized attention and the most select dishes. 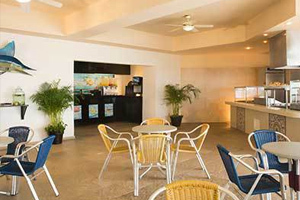 Visit our complete snack bar The Breezze to have a drink in the swimming pool area. An area with a casual ambiance ideal for a pleasant lunch or dinner in good company and in a unique setting. Enjoy a personalized attention and the most select dishes. Lunch: 11:00 a.m. – 5:00 p.m. Dinner: 5:00 p.m. – 6:00 a.m. The place where fun has no limits. Live a unique and different experience at the lively and juvenile ambiance of our Sixties bar. 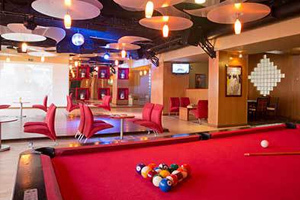 It is a complete video bar with sport events projected on television, pool table and videogames. Bar: 6:00 p.m. – 2:00 a.m.
Beer Garden is located outside the lobby. Let's make a toast for the good times. At our Beer Garden you will enjoy a unique atmosphere in the stunning natural setting of our first-class facilities. Try our selection of international beers and relax in our European garden. Bar: 9:00 a.m. – 10:30 p.m.
A place for entertaining, laughing and enjoying the unique beauty of Cancun. The Tiki Bar offers a lively and colorful ambiance with tropical decoration, happy and friend faces and the beach at the background. 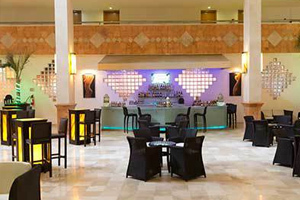 It is the bar that best represents the spirit of the Golden Parnassus: a place for entertaining, laughing and enjoying the unique beauty of Cancun. Bar: 9:00 a.m. – 2:00 a.m. Ideal place for having a cocktail or a delicious meal in the Caribbean beach. 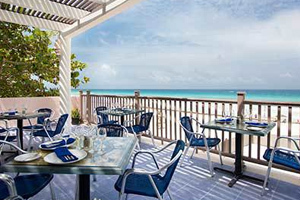 The Dolphin bar is an ideal place for having a cocktail or a delicious meal in the stunning setting of our beautiful Caribbean beach. It is an area of relaxing ambiance and rhythms inspired by the sea where to live your holidays and make a toast for the times to come. Bar: 9:00 a.m. – 5:00 p.m.